All of Colorful Creation’s balloon twisters love making headband sculptures! We’re pretty sure you and your family will too, and it’s something our expert twisters can bring to your party that most balloon artists don’t know how to do! 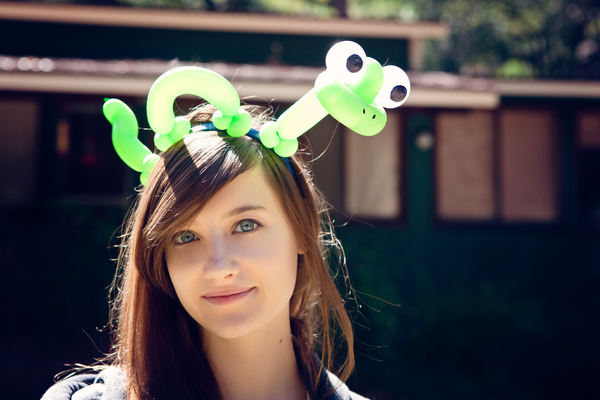 Here are our Top 5 Reasons we love balloon headbands! 1. Hands-free for kids and parents. Kids love playing with balloons! But once they’re done, balloons are either left in the sun or on the ground to pop, or parents have to hold them. Not fun! Headbands are not only hands-free for kids, but they’ll usually forget that they have them on once they start playing. And, if mom or dad really has to carry them, you can wear them too! Easy peasy. 2. Cooler (literally) than hats. Balloon hats used to be The Thing to bring to parties. But most hats are big and as the CT summers heat up, the air inside the balloon heats up and acts as an insulated hat. Simply put, they can get way too warm! 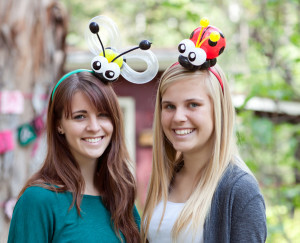 For summer fun, balloon headbands are the way to go. 3. Fast and neat: great for large parties! What’s cool about our balloon headbands is that they’re a neat idea that very few other balloon twisters are doing. That said, they only require a few balloons each and are pretty fast to do once you’ve gotten the hang of it! They’re great for large parties not only because guests love them, but because each balloon twister can accommodate more guests per hour. PLUS, balloon headbands will last about a week. Little guests love to wear them to school the next Monday! 4. A ton of variations for boys and girls of every age. Our balloon headband designs include aliens, ninjas, polkadots, octopuses, and even licensed characters like Avengers, Hello Kitty, Winnie the Pooh, and more! Not only does this mean they’re great for both boys and girls, but that tweens and teens can pick out a design they like too. 5. Impress your guests with something different. Very few balloon twisters are providing headbands, and for most guests it’s something they’ve never seen before! If you want to treat your guests to a really fun time (balloons are entertaining to play with AND watch! ), balloon headbands often get the adults asking a lot of fun questions and kids excited to pick out all their custom colors and designs. 6. BONUS REASON: they are prefect for face painting! Have kids with bangs? Balloon twisted headbands not only are cute, but functional! Our face painters can use them to put back kids’ hair for face painting and let them pick fun matching designs. It doesn’t get much cooler than that!